Fun and well designed Toys and Games will be awarded. Today, A’ Design Award & Competitions announced the newest edition of Toy, Games and Hobby Products Design Award, which is a niche design competition open to submissions of toys for kids, recreation equipment and hobby sets and games. Toy and Recreation Equipment manufacturers worldwide are invited to take part in the competition by applying online at adesignaward.com. Submitted products will be evaluated by a specialized jury composed of a panel of academics, business professionals and focus group of end-users. The ultimate goal of the award is to attract the attention of the media to award winning products through advertising and publicity opportunities. Winning entries will receive free communication and publication services from A’ Design Award in addition to the award trophy, certificate, badges, logo and other services that are provided to award winners. 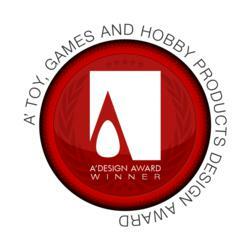 Unlike any other awards in toy industry, winners are not obliged to make any further fees for claiming the award, and winners’ benefits as listed in adesignaward.com will be provided free of charge to all winners. Prospective participants can apply online at adesignaward.com by paying the single time nomination fee of 375 Euros. A' Design Award is organized in many diverse categories therefore the prospective winners of the A' Design Award can expect to reach an audience that is wider than their own niche: the award not only reaches the specific media in recreational goods and toy industry, but more importantly, it reaches a wider, design oriented public such as design oriented media; editors, consumers, decision makers and buyers. About the A’ Design Award: The A’ Design Award & Competition is an annual international design award and competition aiming to highlight design oriented services, products and offerings. A’ Award present its winners with publication and advertising opportunities. Further information regarding the award can be accessed from whatisadesignaward.com.